He emphasised that feedback bridges the gap between teaching and learning and to be effective it requires engagement, it’s just not meaningful as an independent act. He urged us to make our feedback learner driven and to position it as part of learning. 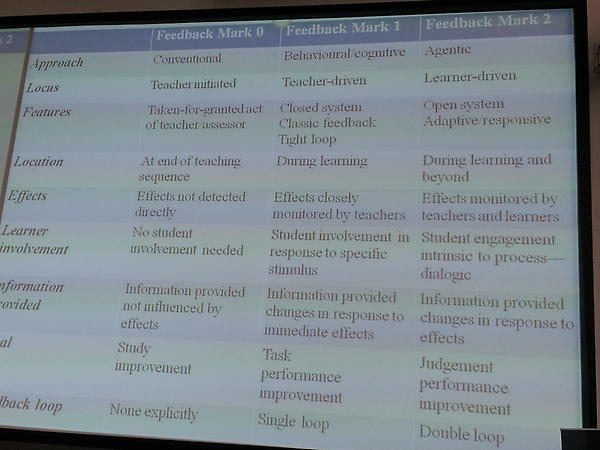 Judge feedback in terms of effect, on what learners do, on improvement! Digital might mean doing bad feedback more efficiently. Is there a more educationally destructive concept than anonymous assessment?